Liz Halliday-Sharp and Fernhill By Night. Photo by Leslie Threlkeld. 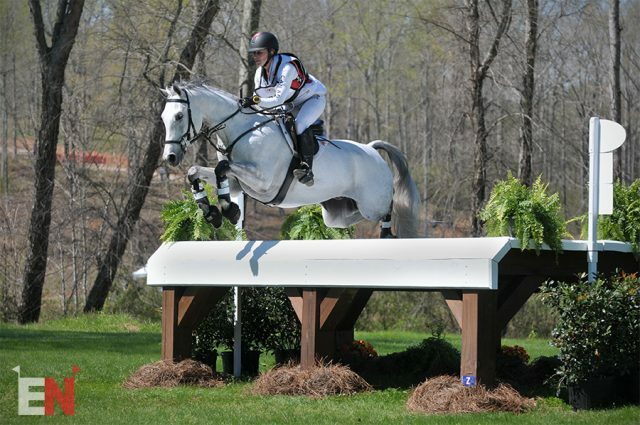 Going into today’s cross country phase at The Fork Horse Trials at Tryon International Equestrian Center, Liz Halliday-Sharp said the main goal was to have a clear round with Deborah Halliday’s Fernhill By Night, who is bound for Rolex later this month. Yet win they did. 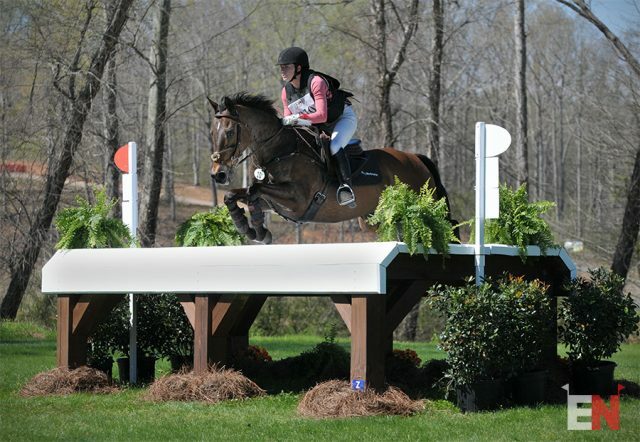 Leading from start to finish, Liz and Blackie produced three foot-perfect phases to win the Advanced A division. Scoring a 25.9 to take the early lead after dressage, they held their position with a double clear show jumping round. Today they were confident and smooth all the way around the Captain Mark Phillips and Tremaine Cooper designed cross country course, coming in with no jumping penalties and 8.4 time to finish on 34.3. 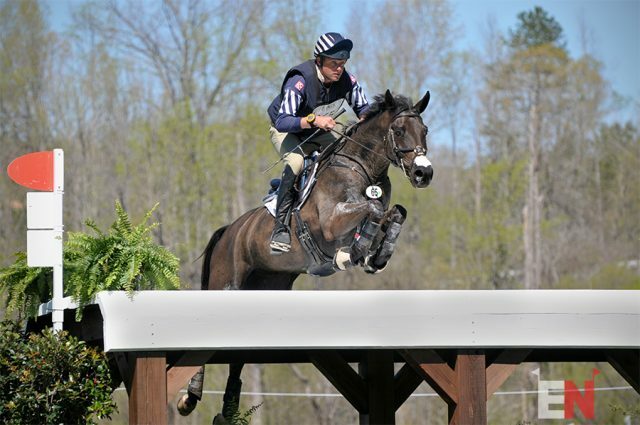 The Four Star Eventing Group’s Obos O’Reilly is continuing on his comeback tour with a second place finish in Advanced A. 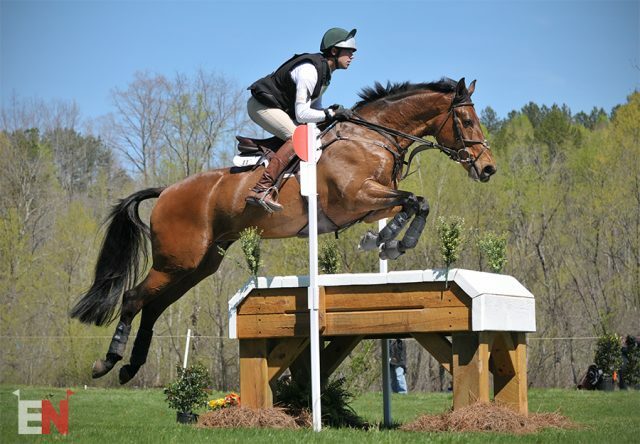 The 14-year-old Irish Sport Horse competed just once last year but came back on the scene in the Carolina International CIC2* last month where he and Will Coleman finished in eighth place. At The Fork, Will and “Oboe” scored 30.8 in dressage and added a rail in stadium to sit in fifth place before cross country. With the fastest time in the division, they added 2.4 time penalties and moved up to finish in second place. Will has entered Oboe at Rolex along with his stablemate Tight Lines, who finished fourth in Advanced B.
Canadian rider Jessica Phoenix had a big week with four horses entered across the two Advanced divisions. She was the first out on course this morning with A Little Romance, but was unfortunately unseated at fence 15. Horse and rider were okay and Jessica returned to pilot first Pavarotti and then Bentley’s Best around the Advanced course clear. She opted to withdraw Bogue Sound. Don Good’s 15-year-old Westphalian Pavarotti was in a good position after the first two phases sitting in second place on 29.2. Adding 15.2 time penalties they finished in third place in the Advanced A division. A highlight for Jessica will have been Bentley’s Best’s win in the Advanced B division. The 10-year-old Trakehner gelding–also owned by Don Good–scored a 34.6 in dressage, added a single show jumping time penalty and then powered around the cross country course with 8.8 seconds to add to secure the win on a final score of 44.4. “Bentley’s Best had one of his best weekends ever!” Jessica said. “I was so proud of everything he did. In all three phases he felt really confident and really playful in his jump. He felt like it was getting pretty easy for him at this level which is really exciting. From the start flags to the finish (everything rode well). It’s not often you can say that but it was just a blast. Coming in second in Advanced B was Boyd Martin and 10-year-old Tsetserleg. 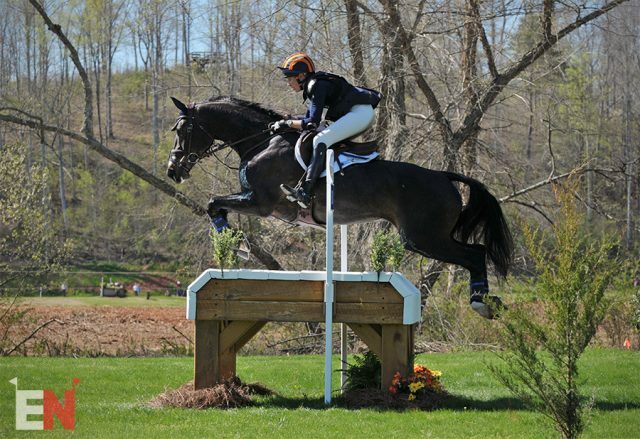 The two parted ways at Red Hills CIC3* in March but they looked in sync this week. A 34.7 put them fourth after dressage. Two rails and a time penalty in show jumping dropped them down one place, but Boyd and Christine Turner’s Trakehner went clear on cross country with just 7.2 time penalties for a final score of 47.3 and a move up the leaderboard. 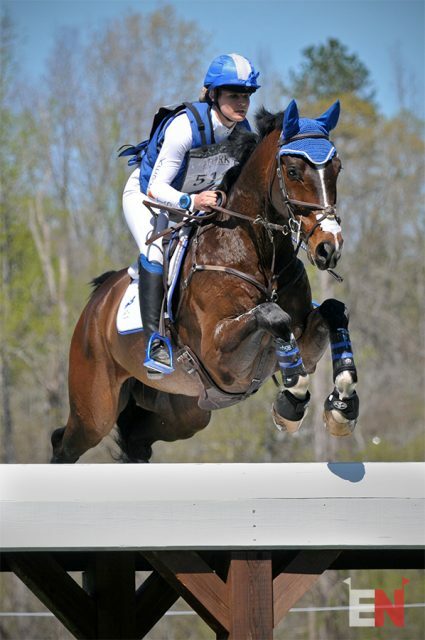 Coming all the way from Washington State to make their third bid at Rolex, Jordan Linstedt and her and Barbara Linstedt’s 14-year-old Hannoverian Revitavet Capato will head to Kentucky riding a third place finish at The Fork. They were leading the way after dressage on 31.5 but dropped down to third with two rails and three time penalties in show jumping. They rocked around the course today with no jumping penalties and 7.2 time for a finishing score of 49.7. There were no double clear rounds in either of the Advanced divisions. However, the course rode as well as the three-star with only one rider picking up 20 penalties besides Jessica’s unscheduled dismount.